Last week I did a quick post to let you know about the #BirchboxManithon supporting the charity Coppafeel (you can find the post here). As I said in that post I wanted to try and get some nail art ready to post on the day of the Manithon but obviously I didn't manage this. Unfortunately I've been a bit busy this week, but I'm only a few days late! I didn't have much time to create any kind of fancy design so I just went in with a dotting tool and created a couple of flowers on my ring finger and a cascade of dots down the side of each nail. It's a little bit rough so that's why I've not include a close up picture. As you can see I forgot to do my thumb and I didn't even attempt the other hand! As I said in my last post even if you couldn't get down to the Manithon you can still contribute by buying one of the limited edition T shirts* designed by Sally Faye Cotterill, which I'm modelling above. Sorry for the chopped off head but I hadn't had time to wash my hair! Being a size 10 but sometimes a 12 if the sizing is particularly small I went for a 10-12. This size is now sold out but you can still find sizes 6-8, 8-10 and 12-14 but be quick as once they're sold out they're gone. 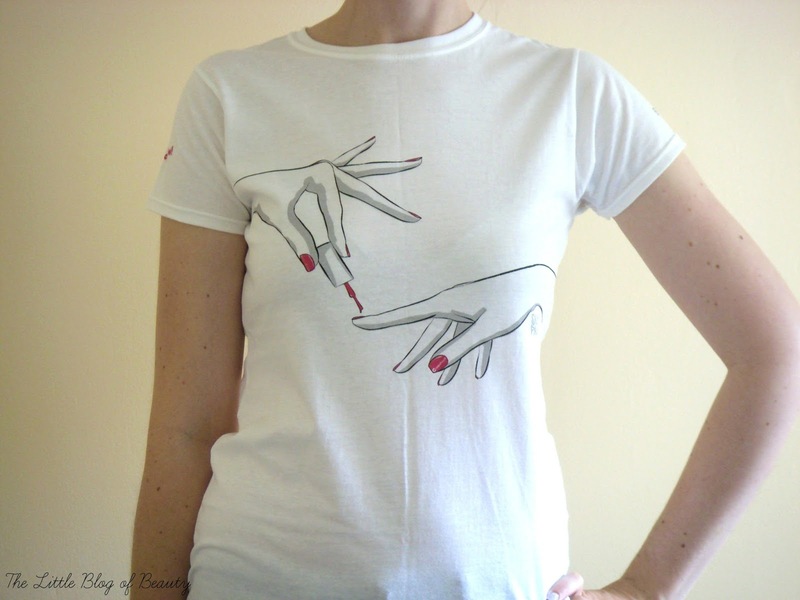 The T shirts are good quality and if you're a beauty blogger or nail varnish fan the design is amazing. You can find the T shirts in the Birchbox e-shop here. Did you manage to make it to the #BirchboxManithon?